The State Visit is the crowning highlight in a special year for the UK-China relationship – a global partnership for the 21st century – and a spectacular celebration of our shared appreciation of heritage and culture. This partnership shows that our two countries are open for business, that we are the economies of the future and that we work closely on the international stage. 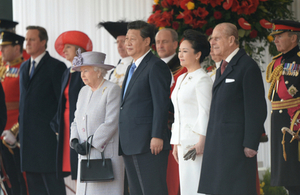 Earlier today the Queen and The Duke of Edinburgh formally welcomed the President and Madame Peng at the Royal Pavilion on Horse Guards Parade. You can view the full programme of events at Royal.gov.uk. The State Visit will see more than £30 billion worth of trade and investment deals completed, creating over 3,900 jobs across the UK. As the second biggest economy, numerous commercial deals spanning a range of sectors such as the creative industries, retail, energy, health and technology, financial services, aerospace and education will be signed, providing an opportunity for British and Chinese businesses to forge stronger links. The visit will also open up export opportunities for UK companies looking to expand into China and attract Chinese investment into the regions. The Northern Powerhouse will get a boost as China is expected to announce further investment into the region when the Prime Minister and President visit Manchester at the end of the week. This is going to be a very important moment for British-Chinese relations. Trade and investment between our two nations is growing and our people-to-people links are strong. This visit will be an opportunity to review all of these things but also talk about how the UK and China can work together on global issues such as climate change and tackling poverty. It’s a real opportunity to deepen our relationship. My ambition is to see Britain as China’s biggest trade partner in Europe. We want to be the most open economy in Europe to Chinese investment, to trade with China in order to secure British jobs and British prosperity working with China, which is the world’s second largest economy, at the moment, and will become the world’s largest economy over the next six or seven years. It is very much in our national interest to engage with China. This is a way of working together to support the prosperity of Britain, the economic growth of Britain and also to work with China to ensure that China’s emergence is done in a way that ensures she respects the rules-based international system and works with the grain of the international community to be, and to remain, a responsible player on the world stage.